Newsletter | Donabate, Portrane & Balheary Parish | We would like to extend our welcome to you to the parish of Donabate Portrane and Balheary and to introduce the church services available to you and your family. This website has been developed to present helpful information and a sense of belonging. It is also an invitation to become involved at some level in the life of the parish and to use your talents in the service of others. Whether you have lived here for many years or have recently moved here does not matter; you are currently part of a welcoming and caring faith community. St. Patrick’s Donabate @ 7.30 p.m.
Inter Church Service at 12 noon beginning at St. Patrick’s Church of Ireland and moving in procession to St.
St. Patrick’s Donabate @ 3 p.m.
St. Ita’s Portrane @ 3 p.m. The Immaculate Conception, Balheary @ 3 p.m.
Stations of the Cross – St. Patrick’s Donabate @ 7.30 p.m. The church will remain open for private prayer and reflection until the beginning of the Vigil. St. Patrick’s Donabate @ 9 p.m.
St. Ita’s Portrane @ 9.30 a.m.
St. Patrick’s Donabate @ 11 a.m. The Immaculate Conception, Balheary @ 11.30 a.m.
Holy Saturday, 10.30 – 11.30 a.m. and 8 – 8.45 p.m.
A new European Data Protection Law, the General Data Protection Regulation (“GDPR”), is being introduced on 25 May 2018. This new law applies to any organisation, including our parish that manages and processes people’s personal information. We are now working on ways of ensuring that what we do with your information is compliant with this new law. It is a work in progress and over the next few months we will keep you informed through the parish website and in the notices/newsletter as policies are put in place. If you have any questions about this please contact the Parish Office. Aiming to serve and support young people (13-30) in their faith through a mixture of Spiritual, Serious, Service & Social activities. Youth Programme for Dublin Diocesan pilgrimage to Knock – Sat 27th April – book your place now! Open to all aged from 13-30. There’s also the option to travel on a dedicated youth bus. 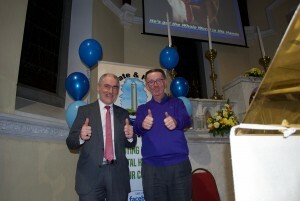 Donabate Parish Youth – Have your say survey! Open to all young people aged 13-30. Great way to meet other young people in the parish and beyond, grow your own faith, learn/practice leaderships skills, have something different for inclusion on a CV! What some ‘time out’ during Lent? Why not spend some time with Jesus in the Blessed Sacrament. A thought provoking quote and microchallenge for each day of Lent. 8pm-9pm each Thursday of Lent in Donabate parish hall library room. Music, talks, network with other young people. Donation only, bring a sleeping bag! 8 Sessions from 25th Feb to 15th April. Tuesday Nights, 6pm to 8pm. Maranatha – upcoming dates – next one Fri 5th April! An hour of song, reflection, candles and prayers for our young people, all in the presence of the Blessed Sacrament. All welcome. Burning Hearts (18-45yr olds) – upcoming dates – next one Fri 5th April! What else would you be at on a Friday night? We’re getting Young Adults together for Worship, Teaching & Fellowship on the First Friday of every Month. We’ll begin with Mass at 7 pm. There will be a cup of tea to follow! An Opportunity to Make New Friends and Grow in Faith. All are Welcome! We received the Holy Spirit at our Baptism and our Confirmation, but for many of us, this can be little more than a nice memory from our childhood. Through a life in the Spirit Seminar, we hope that you will experience your own personal Pentecost and begin to live fully God’s plan for your life! Keep up to date on Diocesan events for young people with the new ‘Diary of a young church’! Join other young adults [20’s & 30’s] for reflective hikes around Dublin Area. Monthly event. Thursdays from 7-8.30pm in St. Paul’s Church, Arran Quay. Join other [20 & 30 year olds] to meditate, share and discuss life, faith, purpose and how to live life to the full. We read a chosen spiritual book over a few weeks and come to reflect and discuss our thoughts. New dynamic, creative and energetic internship programme. It’s a mission year to serve, lead, and grow as a person. 1 Corinthians 3:6 says, “I planted the seed in your hearts, and Apollos watered it, but it was God who made it grow.” Alpha have the amazing privilege of working alongside churches and schools across Ireland, helping young people access a conversation about Life, Our Purpose and Meaning through the lens of Christianity. They depend on people of faith to help this happen. Alpha are looking for 18-25 year olds who want to serve on the team for 9 months, with the option to extend to 12 months. We have places available in Dublin, The Midlands and Cork, with each location supported by a regional coordinator. This is a paid internship. The gross salary is €18,000 per 12 months. Interns are expected to raise 44% of the salary over the course of the year, with training provided on fundraising. We wish you all a very Happy Easter and we thank all who helped out with the Holy Week Liturgies. Your help and support are very much appreciated. Easter Dues may be hand in during the coming week. 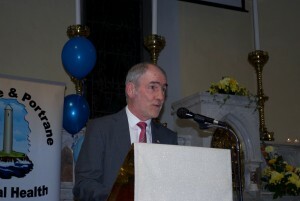 Trocaire Boxes may be handed into the Parish Office during the coming week. Thank you to all who contributed to the St. Vincent de Paul Sunshine House collection last weekend. The amount collected was €1,185. As we celebrate Easter would you like the opportunity to see all the places that we have head about since childhood, Bethlehem, Nazareth, Cana, Sea of Galilee, Jerusalem, Magdala, and much more. Heart to Hand Annual Food Appeal – Good Friday 19 April. We kindly ask you to bring food to the church on Good Friday. Heart to Hand distribute Food to a variety of shelters and food centres throughout Ireland. The following items would make a big difference to peoples lives. Rice, Pasta, Tinned Food, Tea, Coffee, Sugar, Cooking Oil, Baby items and Toiletries. We thank you for your continued support. Donabate Portrane Dramatic Society proudly presents “Haywire” by Eric Chappel in Donabate Community College on Wednesday 24 – Saturday 27 April at 8 pm. Contact 086 0712530. General Operative Vacancies at DPCC – are you in receipt of a Social Welfare payment and looking to return to work? 2 Vacancies on our Community Employment scheme are open for applications. Working in DPCC 19.5 hrs per week, FETAC courses available to re-train. Phone Carmel on 8406422 for more information . DONABATE PORTRANE MEALS ON WHEELS Driver required for Lunch delivery one day a fortnight. It is a great way to help out in your community. If you would be interested in joining our team please contact the Parish Office. Please join us on Sunday after 11 Mass at Our Lady’s Altar to pray the Rosary. Eucharistic Adoration is held every Friday evening 6.30 – 7.30 in Donabate Church. This is an opportunity to take time out of our busy lives for silent prayer in the company of Jesus our Lord. Handmade Rosary Beads made by a local lady for sale in the Parish Office. Céilí Dancing – Monday night at 8.30 – 10 pm (from September – May) in Donabate Portrane Community Centre. New members very welcome. Céilí dancing is great fun and an enjoyable way to get fit. Cost: €5. Active Age Line Dancing on Mondays at 1 – 2 pm in the Donabate Portrane Community Centre. We would be delighted to see new members in 2018. It is a fun way to get fit and meet new friends. Baby cardigans knitted by a local lady for sale in the parish office in aid of the Church roof repairs. Cost €10. Fingal Community Alert – Free Alarms fitted from 1/11/17 now come with one years free monitoring. Contact Frank 086 2567042. ALONE help thousands of older people deal with issues, big and small. ALONE services are available throughout the country and open to anyone over 60 regardless of location, capacity or housing situation. ALONE helps with Health, Finance, Housing, Company & Friendship, Event and linking with other services. St. Patrick’s Donabate – Friday 6.30-7.30 pm. The Donabate / Portrane Senior Citizens Social Club and Day Centre is open to all people of the parish over the age of 50. We open every Wednesday and Friday from 10 AM – 1 PM in the Parish Hall. We regularly hold events and have at least one outing a month. All are welcome. If you need transport to the Day Centre, please phone Mary on : 087 230 0496. Bingo every Thursday night at 8.30-10.30 in Donabate Portrane Community Centre. 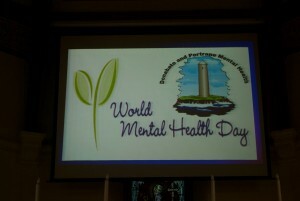 Donabate Parish celebrating World Mental Health Day with guest speaker Mickey Harte, Tyrone Football Manager.